The extreme cold in half of the country had a profound effect on housing starts which fell 16% in January. 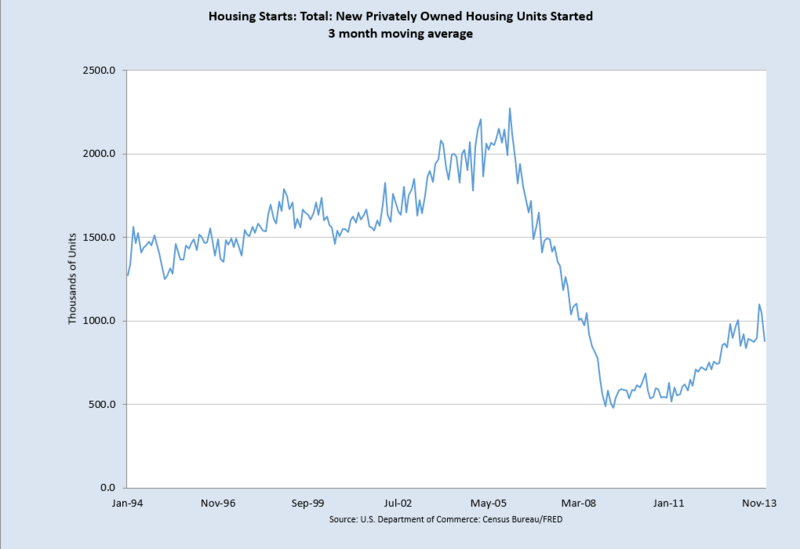 Less affected by the weather are permits for new housing which slid 5%. The Bible prescribes that every 50th year should be a Jubilee year, in which all debts are forgiven. While this policy of redistribution of property might be a practical solution in a smaller tribal society, it is much less practical, even dangerous, in a complex economy. By targeting a 2% inflation rate, central banks in the developed world engage in a type of gradual debt forgiveness. Inflation incrementally shifts the real value of a debt from the debtor to the creditor. 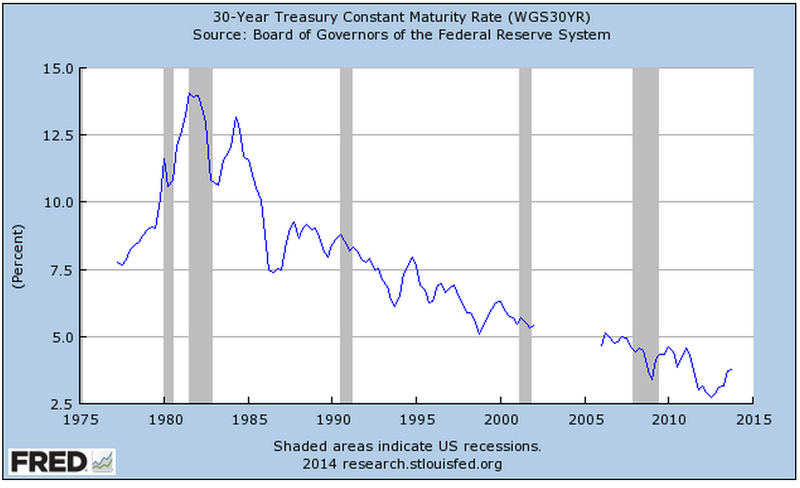 At a 2% inflation rate, a debt is worth half as much in 35 years. Let’s say Sam borrows $1000 from Jane at 0% interest and doesn’t pay her anything for 35 years, then pays off the debt. The $1000 that Sam pays back in 35 years is only worth $500 in purchasing power. Half of Sam’s debt has effectively been forgiven. So why would Jane loan Sam any money? She wouldn’t – not at 0% interest. At that interest rate the loan is actually a gift. Jane would need Sam to pay her an interest rate that 1) offsets the erosion of the purchasing power of the loan amount, the principal, and 2) compensates Jane for the use of her money over the 35 years. If your name is just plain old Sam though, few people want to loan you money for thirty years, even if it is to buy a hard physical asset like a house. That is why U.S. government agencies back most of the mortgages in the U.S., essentially funneling the money from around the world to ordinary Sams and Janes to buy housing. Heck of a system, isn’t it? In the metro Denver area, median household income was $59,230 in 2011, compared to the national median income of $50,054. (Source) According to Zillow, the median home value in Denver is $253,700, or 4.3 times income. Although Denver is a large city, it is not a megalopolis like New York City or Los Angeles. In Los Angeles, median home values are $491,000. Median incomes in 2011 were $46,148, so that home values are more than ten times incomes. Like other megaregions, Los Angeles has a huge disparity in housing and incomes, resulting in a median income that is skewed downward because of the large number of poor people that inhabit any large metropolitan area. The L.A. Times ranks incomes by neighborhoods. This ranking shows a median income in middle class areas at about $85K. Using this metric, housing is still more than six times income. Using a conventional bank ratio of .28 of mortgage payment to income, a household income of $85K will qualify for a monthly mortgage payment of almost $2K, which will get a 30 year, 4.5% fixed interest mortgage payment, including property taxes, of about $320K. A 20% down payment of $80K brings the price of an affordable house to $400K, below the median value of $461K, meaning that many middle class Los Angelenos can not afford to live in a middle class neighborhood. 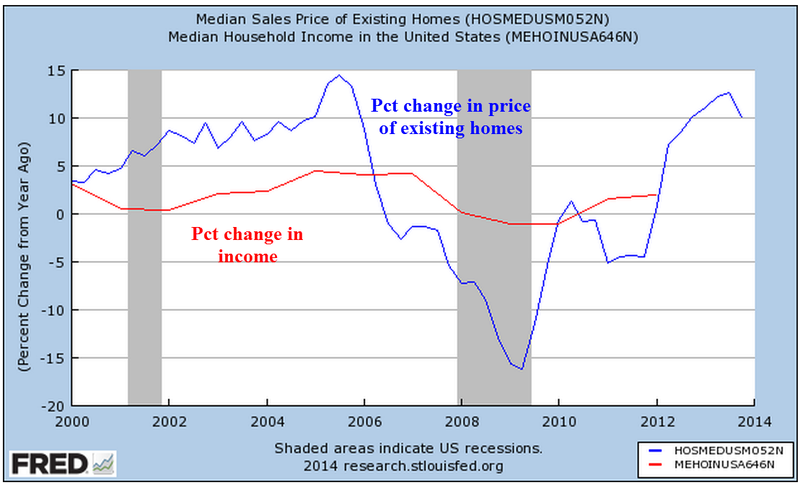 … acts as a constraint on home sales. This week the National Assoc of Realtors reported a year over year 5% drop in existing home sales. After rising more than 10% over the past year, prices have outrun increases in income. While we don’t have median household income figures for 2013, disposable personal income actually declined in 2013 so we can guesstimate that household income was relatively flat as well. 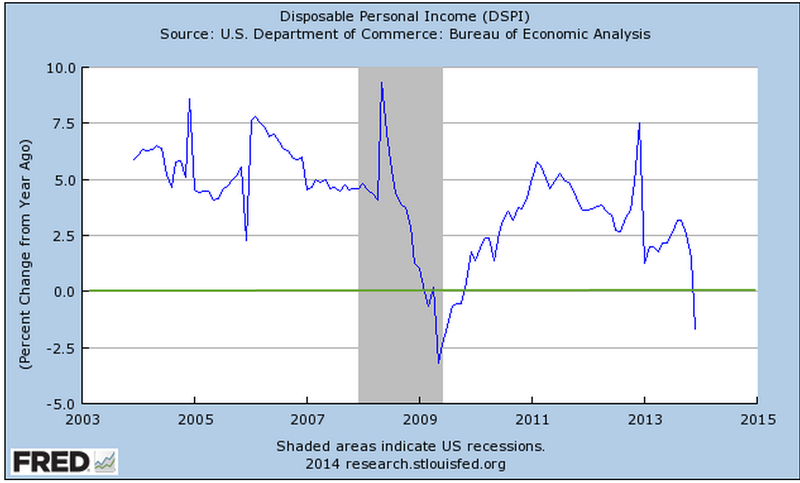 As this year progresses, we may see other effects from the drop in disposable income. Economists and market watchers will be focusing on auto and retail sales in the coming months. January’s Consumer Price Index showed a yearly percent gain of 1.6%, indicating little inflationary headwinds. An obstacle to growth is the difference between inflation and the weak growth in household income. On Tuesday, the Congressional Budget Office released their estimate of the net effect of raising the minimum wage to either $9 or $10.10 from the current Federal level of $7.25 an hour. Their analysis ranged from a minimal loss of jobs to almost a million jobs lost. The average of this range, 500,000 jobs lost, became the headline number. The CBO also noted that over 16 million low income workers would see an increase in income, enabling some to rely less on government aid programs. Their projection was a slight increase in revenues to government. A half million jobs is relatively small in a workforce of 150 million. Some economists would concur that there is no clear evidence that raising the minimum wage has any effect on the number of jobs. The science of economics is the study of complex human behavior in response to changes in our environment and resources. Many times the data is not as conclusive as one might like, leading researchers to statistically filter or interpret the data according to their professional biases. A 2013 analysis of minimum wage workers by the Economic Policy Institute indicated that the average age of minimum wage workers was about 35 years old. Yet, 2012 data from the Bureau of Labor Statistics, the primary aggregator of labor force characteristics, does not support EPI’s conclusions – unless one includes workers who are exempt from minimum wage laws – like waiters – who are paid below the minimum wage law. The BLS data shows that 55% of minimum wage workers are below 25 years old. Too frequently, financial reporters who could summarize the caveats of a particular study either don’t bother or their work is left on the editor’s floor. Many readers digest the headline summary without question and a difficult guesstimate by a government agency like the CBO is re-quoted as though it were gospel truth. On the bright side, an early indicator of manufacturing activity in February showed a rebound from January’s decline. As the market continues to rise, the voices of caution, if not doom, get louder. Some analysts are permanent prophets of catastrophe. Eventually they are right, the market sinks, they proclaim their skills of prognostication and sell more subscriptions to their newsletters. Subscribers to these newsletters don’t seem to mind that the authors are wrong most of the time. 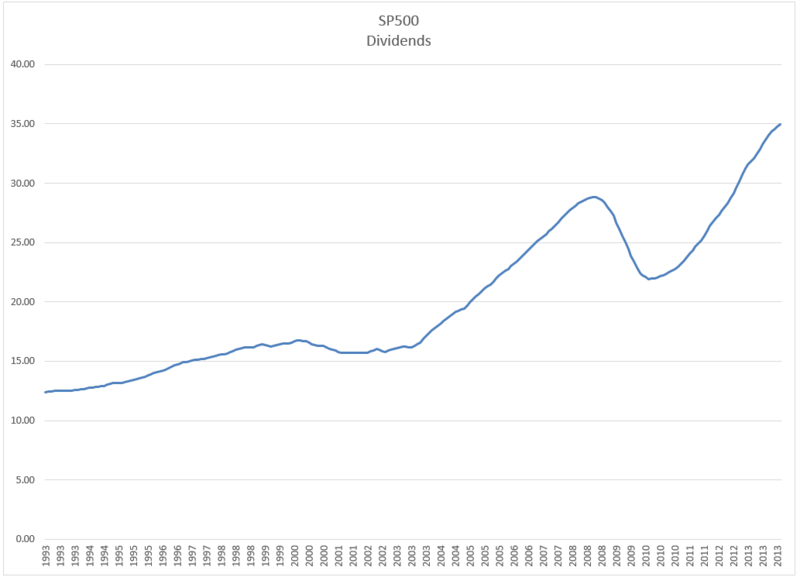 Last August, I wrote about the dividend yield – or it’s inverse ratio, the price dividend ratio – of the SP500 index using data that economist Robert Shiller compiles from a variety of sources. The dividend yield of the SP500 index is currently 1.9%, meaning that for every $100 a person invested in the SP500 index, they could expect $1.90 in dividends. The price dividend ratio is just the inverse of that, or $100 / $1.90 = 52.6. The current dividend yield is at the 20 year average. I will focus on the dividend yield, or the interest rate that the SP500 index pays an investor. It might surprise some investors that dividend information is available on a more timely basis than earnings. In the aggregate, dividends are more reliable and predictable. Most companies have several versions of earnings and they massage their earnings to present the company in the best light. On the other hand, most companies announce their dividend payouts near the end of each quarter so that the aggregate information is available to an investor more quickly than aggregate earnings. Most portfolios contain a mixture of stocks and bonds so it is instructive to compare the dividend yield of the relatively risky SP500 with the yield on what is considered a perfectly safe bond – the 10 year Treasury. Many investors think of these two asset classes as complementary – they are – but they are also in competition with each other. 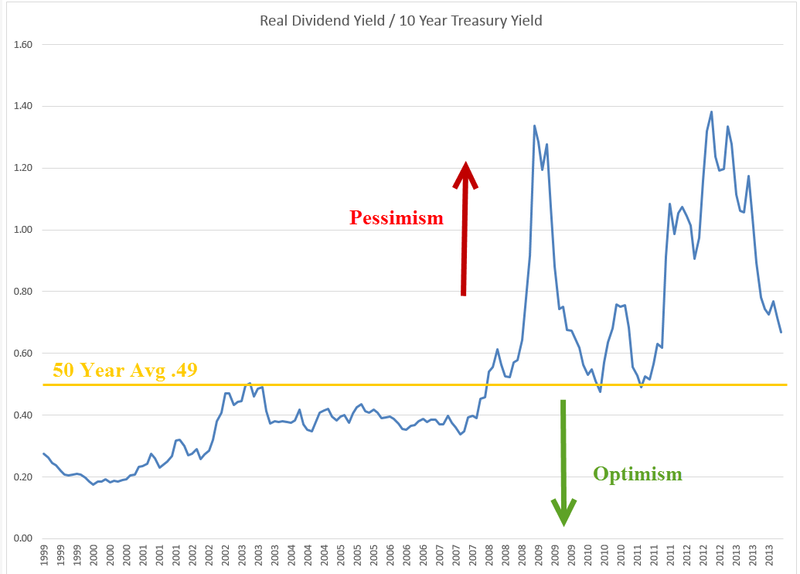 If the real dividend yield on stocks is the same as ten year Treasuries, it means investors in stocks want to be compensated for risking their principle on stocks. If the interest rate on 10 year Treasuries is 4% and the dividend yield of the SP500 is 2%, then the dividend ratio of stocks to Treasuries is 2% / 4%, or .5. As investors perceive less risk in the stock market, this “demand for yield” from stocks will fall and the ratio will decline. In the past, this ratio has reached a low of .19 in July 2000 as the stock market reached its apex of exuberance and investors became convinced that the rise of the internet and just in time inventory control had ushered in a new era in business. Bill Gates, then CEO, Chairman and founder of Microsoft, scoffed at dividends as a waste of money that could be better put to use by a company in growing the business. At the other extreme, this demand for yield ratio rose as high as 1.28 in March 2009 as stocks reached their lows of the recession. More importantly is the movement of this ratio from peaks and troughs, indicating a change in sentiment among investors. Note that the early 2003 market lows after the tech bubble burst were about the 50 year average of this ratio. Compare that relative calm to the spikes of fear in this ratio since late 2007 to early 2008. For the past 18 months, this demand for yield has declined but is still above the 50 year average. There is still enough skepticism toward the stock market that it continues to curb exuberance.